With a three-game sweep of the Atlanta Braves, the Philadelphia Phillies have served notice to the National League East. During the offseason, the Philadelphia Phillies biggest priority was to find people who could generate offense on a consistent basis, something they struggled with last season. Led by the acquisition of right-fielder Bryce Harper, left fielder Andrew McCutchen, shortstop Jean Segura, and catcher J.T.Realmuto, the Phillies, at least for the first week of a very long season, are looking like a team that’s not going to suffer through a whole lot of slumps this season. 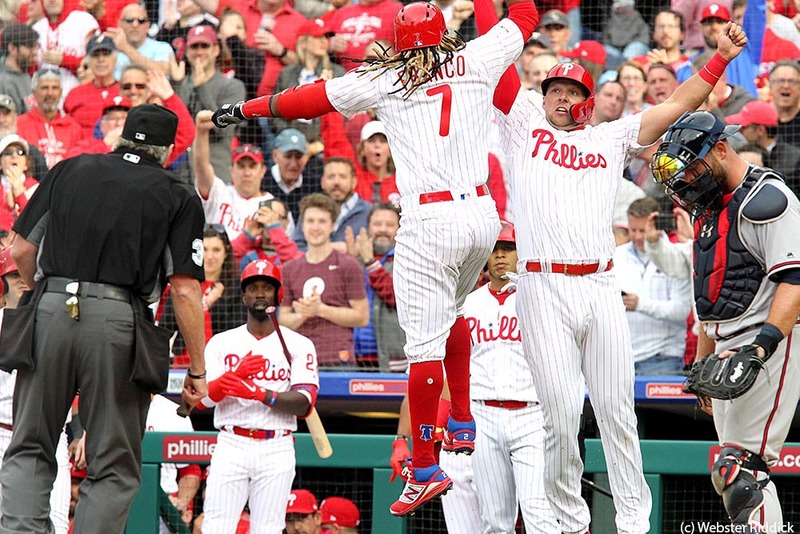 Left-fielder Andrew Mc Cutchen in the first inning got a lead off homerun and Maikel Franco belted a three-run homer to lead the Phillies to a victory 10 – 4. Harper, McCutchen, and Maikel Franco have two. Hoskins and Realmuto each hit a home run for the Phils in the first three games of the season. The opening weekend series sweep of the Atlanta Braves gave fans a glimpse of the offensive juggernaut this team has the potential to be during the 2019 season. In those three games against the Braves, the Phillies set a franchise record for the most home runs in the first game of the season with eight. The previous record was seven back in 1935. The one thing that Phillies manager Gabe Kapler likes about his hitters is their patience and the ability to look for their pitch. 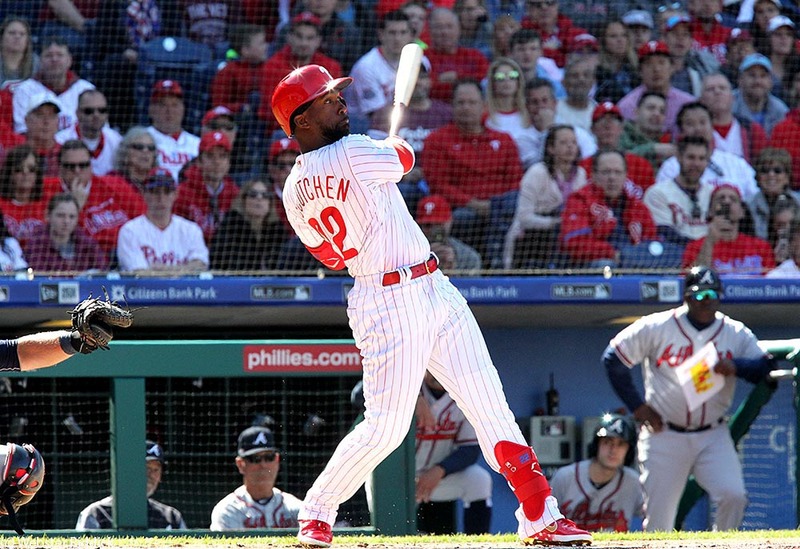 During the Atlanta series, the Phillies had 20 walks-the most in an opening series since 2011. He said the patience of his team from McCutchen down to the No. 8 hitter is special. ”Rhys (Hoskins) has that, Bryce has it and we have it up and down the lineup,” Kapler said. And certainly, the Phillies starting pitchers also appreciate the power of the offense after the first three games of the season. After the Phillies 5-1 win over the Braves, starting pitcher Jake Arrieta said the Phillies are going to be tough to beat his season. For one thing, you have seven guys in the Phillies starting lineup that hit at least 15 home runs or more last season. Six of those players hit at least 20 homers last year as well. Looking at what the Phillies offense has done so far, there will be more than a few opposing pitchers looking to throw brush back pitches. That happened to Hoskins, who hit his first career grand slam home run on opening day. In both Saturday and Sunday night’s games, Hoskins had to hit the deck as balls whizzed by his head. The one brush back pitch that more than raised a few eyebrows when Braves relief pitcher Shane Karl hit Hoskins on the left shoulder. When Hoskins got up from the ground, he had a few choice words Karl as headed for first base. Meanwhile, home plate umpire Rob Drake immediately ejected Karl from the game. Seeing his Hoskins hit the deck for a ball thrown at his head did not sit well with Kapler. If the Phillies can keep hitting like this on a consistent basis over the stretch of a long-season, they will probably have more pitchers throwing at their heads. But Hoskins had a few words of advice for opposing pitchers who get upset when either he or teammates go yard on them: “Stop giving up home runs,” he said.